You probably already know that your best colors can have a hugely positive effect on how you look, particularly as you get older. Your best colors, after all, can make you instantly look younger, prettier, and more vibrant. Sometimes, though, you might want or need to wear a color that isn’t your most flattering. 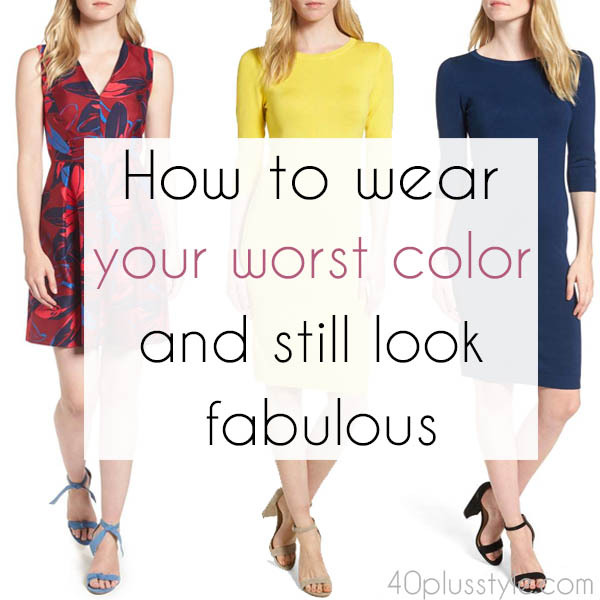 So how to wear your worst color and still look good? It could be that you’re required to wear a uniform that’s an unflattering color. Or maybe you’ve been asked to wear a specific color as a guest at a wedding, or as the mother of the bride or groom, and it’s one that doesn’t look great on you. Or maybe you need to incorporate a less-than-flattering color into your outfits, for instance, if you need to wear a specific color, maybe your company’s or your favorite team’s, but you choose how to wear it. You might even want to wear a color that doesn’t particularly flatter you, maybe because it’s a color you love, or because it’s really current and you want to jump on the trend. It can be a challenge to wear these “bad” colors, particularly for women over 40. Fortunately, knowing how to wear your least flattering colors when the occasion requires can make all the difference in how you look. 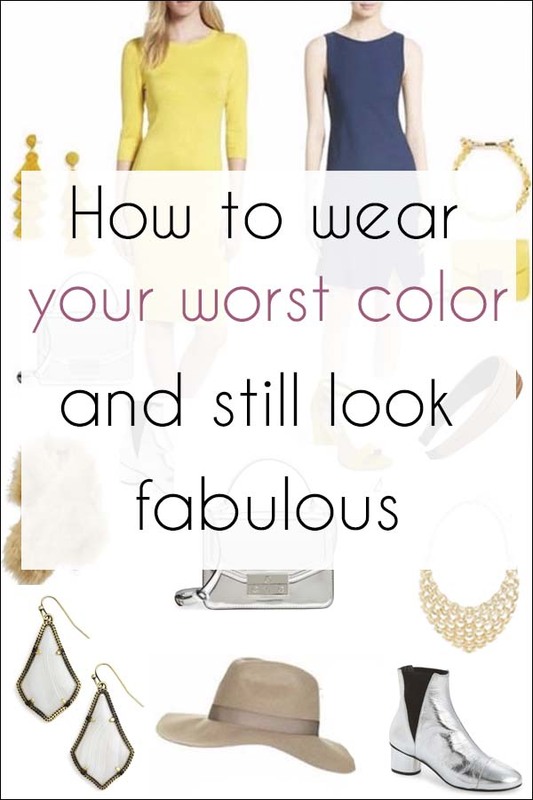 Here are a few ideas to help you look your best even if you’re wearing one of your “worst” colors. Keep it at arm’s length. To wear an unflattering color, keep it as far away as possible from your face. Instead of wearing it in a shirt, dress, scarf, necklace, earrings, or coat, try instead incorporating the color through shoes, pants, tights, or belts. Minimize it. If you want to wear an unflattering color, choose to wear it in small doses. For instance, put on only one or two accessories in that color rather than wearing it as a major piece of your outfit, like pants or dress. Pattern play. 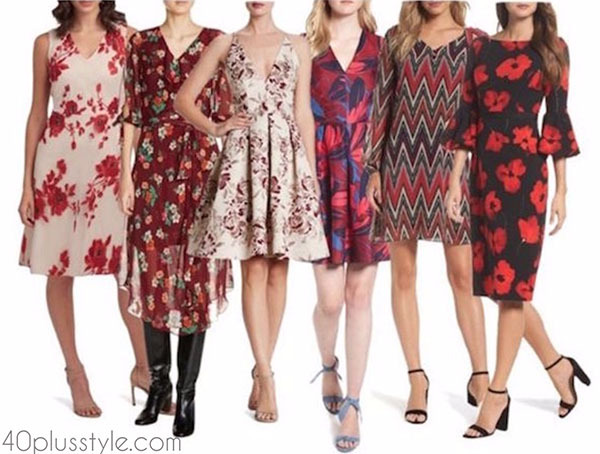 When you have the option of wearing the color in a pattern, try to choose one where the dominant colors flatter you and the unflattering color or colors are more of an accent. Then you can more easily wear it near your face. This tactic can also work with jewelry; limit the challenging color to one of several colors in earrings or a necklace. Top down. If you’re considering wearing the challenging color in a top or dress, look for one with a lower neckline; the farther you keep it from your face, the better. Make the most of the situation. If you’re putting the color near your face, whenever possible, choose a version of the color that best harmonizes with your own coloring. For instance, if you have high-contrast coloring, wear a brighter shade of the color. If your coloring is more muted, opt for a more muted version. Soften the impact. Less-than-flattering colors can be harsh and highlight our flaws, especially as we get older. A few subtle styling changes can minimize this effect. For example, you might wear your hair loose and soft rather than pulled back into a bun or ponytail, if that’s an option. Play with your makeup. 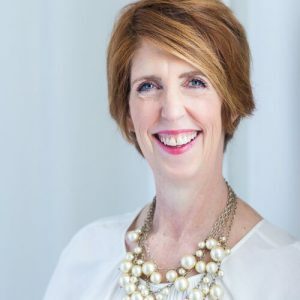 If you’re over 40, chances are you’re already well aware of the miracles makeup can perform. Makeup is especially important if you’re going to wear a non-flattering color near your face. A skilled makeup artist can show you how to fake coloring that isn’t yours by shifting slightly the colors he or she chooses. That will transform the challenging color into one that works well on you—or at least better than it would otherwise. Play with your hair. To take this idea a step farther, if you’ve decided you want or need to make it a regular habit to wear the “wrong” colors, modifying your hair color can help. Not surprisingly, colorists are experts at analyzing coloring, so schedule a consultation with yours to see if you want to tweak your color. Keep challenged. If there’s an unflattering color you’ll be wearing a lot, use it as motivation to create new outfits incorporating your best colors. Do you wear colors that are not your best colors? How do you wear them? I was asked to wear brown and white for a pastor anniversary at church in summer. I don’t like the color brown. It does nothing for my complexion. I decided to wear white brown accesories. Previous post: Bye bye 2017 – Hello 2018: Let’s review and set your 2018 style goals!